Between Marseille (43km.) 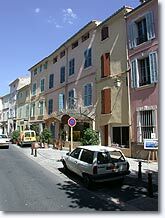 and Toulon (17km.) on highway A50. Perched on the edge of its cliff, on a hill opposite the village of Castellet, this small medieval village benefits from a panorama that goes right to the shores of the Mediterranean. 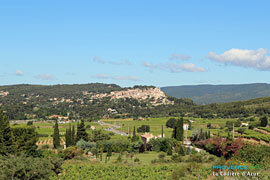 It is surrounded by pine forests and overlooks the renowned and famous Bandol (AOC) vineyard. La Cadière has the charm of those Provencal villages that have retained their authentic identity with its small flower-filled streets steeped in history. Between its colourful lively streets and alleyways, the place Jean Jaurès is brightened up by the indispensable shops: the grocer's, the new fishmonger's, the pork butcher's, and among the other café restaurants, the famous and typical "Cercle des Travailleurs" (Worker's club) reserved for members only, ( a laisser-passer is still required!) There is no doubt about it, this is the place to meet. Whether leaning on the counter or sitting outside at a table, from generation to generation, you find the same customs, the same children's shouts and games that enliven the streets. They call, tease and shout at each other. The older inhabitants are seated on a wood and iron bench, their canes firmly in their hands and their heads full of memories. And unchangeably, like a reflex, everyone, young and old, sooner or later glances up at the iron clock that has been telling the time and overlooking the village since 1551. 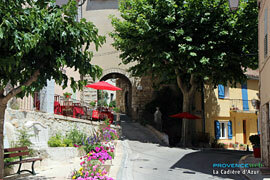 In relation to its heritage, La Cadière has preserved some traces of its past. 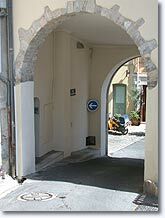 The remains of the old village's ramparts have three majestic gateways, Saint Jean's gateway in the centre, the Mazzarine gateway to the east, and the Colle gateway to the west. 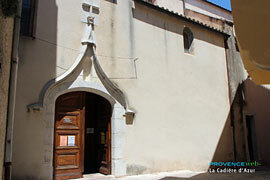 Beside the town hall, with its permanently flower-filled balconies, is Saint Jean's gateway dating from the 16th century. Its wooden doors spiked with enormous nails are still in place today. Visitors can wander around in the warm, increasingly narrow lanes, whose stairs intertwine with the houses inside the rampart walls. The climb up to the church of Saint André, even closer to heaven, is effortless. 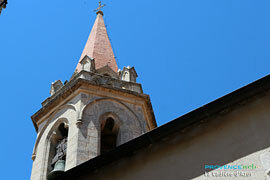 It was built at the beginning of the 16th century on the ruins of a 12th century church. 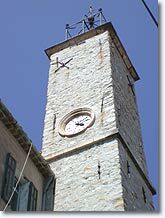 Its bell tower possesses the oldest dated bell in the Var region: 1458. Via the Rue de l'Hôpital you will see the chapel of Sainte Magdeleine, a stonework edifice erected on the ruins of a feudal château. There, on the square, is the orientation table in stone and ceramic representing the village and its surrounding area. It is the work of Anne Marie Surlier the village potter. There are superb walks in the area around the village. Setting out from the Colle gateway, (meaning hill in Provencal) you will be able to follow olive tree lined paths, that run through the famous AOC Bandol vineyards. Today, while La Cadière's main economic resource is wine growing, craftwork has an important place in the dynamism of the village. Whether they are potters, weavers, dressmakers or painters, the craftsmen at La Cadière are in fact all... women. All of them are inspired by the same bright Mediterranean landscape, though each one of them produces very personal work that you will be able to admire in their shops/workshops. 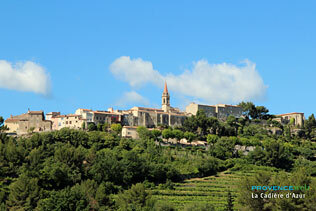 Once you come here, you also will understand why this village has inspired so many famous painters and artists with a passion for the moods and the landscapes of Provence. All of that without overbearing crowds and without having been spoiled by uncontrolled tourism, etc. 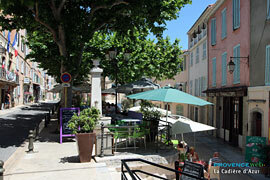 all that and yet a mere stone's throw from superb beaches (St Cyr and Bandol)! Water sports (7km. 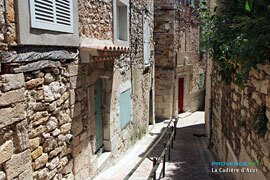 away), horseback riding, tennis..
On the coast : Bandol (14 km), Saint Cyr sur Mer (6 km). 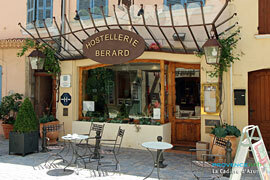 Inland: Le Castellet (2 km), Le Beausset (4 km).